"Be joyful always; pray continually; give thanks in all circumstances, for this is God's will...."
Fellow Dominicans, Ladies and Gentlemen, this is one of the largest and most colourful audiences I have ever seen assembled for an Independence Day Parade! It is always a pleasure for me to see you gather in such large numbers, to witness our disciplined forces on parade, to celebrate the achievements of our country and those who will receive awards today, and to address you. Our disciplined and uniformed groups are immaculately attired, reflecting their pride in serving our country. I salute all on parade here this afternoon. Independence Day Parade 2013 will go down in history, as among the most vibrant. It is a source of great hope for our nation, when babies, children, young people, adults, the elderly, male and female, can all embrace our culture and nationhood, through active participation in our Independence celebrations. The atmosphere here today of patriotism and pride, is similar to the euphoria which was experienced at last Friday's National Youth Rally, which also created new records of participation. Your presence tells me, that you have distinguished right from wrong, sense from nonsense, responsibility from immaturity, love of country from love of party. It is with pride that I welcome my fellow Dominicans, members of the Diplomatic and Consular Corps, specially invited guests, awardees and friends. I say a special welcome also, to the many persons from the Diaspora who have travelled from far and wide to celebrate with us today. The presence of all of you here is a clear demonstration that on 3rd November, you have made the time to salute our beloved country. In a true spirit of unity and brotherhood, we welcome the contingent of Cadets from St. Thomas in the United States Virgin Islands. These young people, some of whom are Dominicans, are here to fraternize and to build bridges of friendship with our own Cadet Corps, and we thank them for joining us in celebration of our Independence. You have also created history in Dominica, by being the first group to stay at the newly restored Troops Barracks Hostel at Fort Shirley at the Cabrits, which has been restored by this Government as a community hostel to accommodate local, regional and international groups like yours. We hope that you are enjoying your stay with us. I am aware that there are many of you listening via radio and the internet, who would have liked to be here, but for various reasons you are not able to do so. I send you greetings and best wishes. The theme of our celebration, "One Mission, One Dominica, Celebrating 35", calls on us to find that quality of love for Dominica, that impels us to dispel our prejudices and differences with one another, and to find avenues of cooperation and collaboration, in pursuing the mission of building our nation. We will not always agree on everything; but if we act towards each other with respect, and commit to engaging in civil dialogue, then we will discover, that there are many matters on which we agree, and on which we can therefore act in unison, for the betterment of Dominica. The mission of the Government which I am privileged and honoured to lead, has been to build a nation that is uniquely ours, to an advanced stage of development. We have placed this country on a path marked by people-centred progress, in the use of science and technology, and the creation of employment opportunities; on a path where culture and the arts can flourish; on a path of tolerance where the respect for dignity of our fellow men, transcend their weaknesses and frailties; A nation where everyone, no matter what his status, likes and preferences, has a place at the table of nation building. 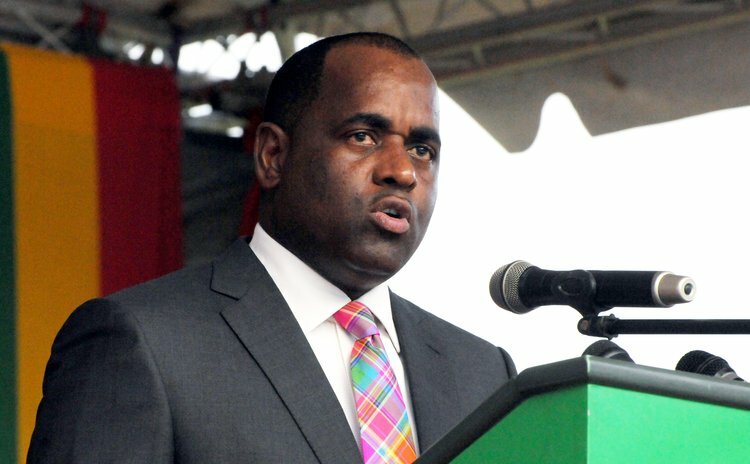 It is heartening to note that the vast majority of the citizens of Dominica remain focused on national development, and have been rallying with Government in its efforts. My friends, the celebration of the 35th anniversary of our Independence, has to include the celebration of the achievers, who have demonstrated their loyalty to our nation with disciplined and dedicated service over a sustained period. Shortly, his Excellency the President will be bestowing awards to a selection of deserving citizens. Their names will be forever recorded in the history of nation building, and will outlast the awards they will receive today. We also want to single out for recognition, some of those among us, who are blazing a path of excellence and promise, and who stand out as models of inspiration for our youth, professionals and the wider society. New opportunity signals as we celebrate the 35th anniversary of our Independence; opportunities that will open up, as we penetrate a new frontier of our development. This new frontier is to be found in geothermal energy. Four weeks ago, we hosted a consultation in Roseau comprising fifteen of our development partners, regional organizations and global experts in geothermal energy development, and representatives of local community and private sector interests. The purpose of the consultation was to share information and exchange views on Dominica`s approach to geothermal energy development. The group of development partners in attendance, commended the Government on its geothermal programme, and pledged their support for its further development. Assured of the technical and financial support for commercializing the geothermal resource of the Roseau Valley, we can pronounce with greater assurance, our vision for Dominica as the undisputed Nature Isle of the Caribbean, a globally recognized sustainable energy advocate, and a leader for Small Island Developing States. We intend to make Dominica the first carbon-negative economy in our hemisphere, and we will continue our efforts in promoting geothermal energy, as the leading answer to creating employment, lower energy costs and increased competitiveness in the private sector. Within a week, drilling of the first production and re-injection wells will commence. This is a precursor to the construction of a small geothermal plant of 15 to 20 megawatts, for supplying electricity to the local market. The plant is expected to be operational by the end of 2015, and consumers can expect to see an initial drop of about 30 per cent in their electricity bills. Negotiations are in progress with a French Consortium for building a 100 megawatt geothermal plant, which will supply electricity to Guadeloupe and Martinique. As the negotiations proceed, we are becoming more and more confident that an agreement will be arrived at, which will be of significant benefit to the people of Dominica. Fellow Dominicans, ladies and gentlemen, Government has invested heavily in agriculture, a sector which grew by over 5 per cent in 2012. This has resulted in us achieving a certain level of food security in Dominica. Now that the abattoir being constructed in Layou Park is almost complete, the country is now positioned to achieve self-sufficiency in the supply of poultry and pork. The opportunity is now wide open for existing and potential poultry and pork farmers, our young men and women, to take up the challenge of supplying these products to the nation. We are encouraged by the effort of one company, which has decided to establish two hatcheries, to supply young chicks to the market. We are hopeful, that others will follow their example and make the decision to contribute to the nation`s requirements for dietary protein, create jobs at home, and save foreign exchange. Let me today remind all existing and potential farmers, that under the apprenticeship and mentorship programmes, assistance in the form of a contribution to wages, is available to any farmer who is willing to engage a young entrepreneur interested in establishing an agricultural enterprise. Both the AID Bank and the National Cooperative Credit Union have responded to the call for further investment in agriculture, by introducing highly concessionary financing to farmers. The facilities available from these institutions, will augment those of government in the Agricultural Investment Unit, and via support programmes to the National Development Foundation. Fortunately, Government has had the foresight, and has invested heavily in the infrastructure required for successfully conducting trade in agricultural commodities, under the current international rules. Equipment to be installed in the recently completed pack houses, will soon be purchased through financing facilities made available through the CARICOM Development Fund. The final link in the production and export chain that is being tackled, is transportation. An allocation of $4.0 million was made in this year`s budget to go towards the purchase of an appropriate vessel for transporting agricultural and other products. Discussions are ongoing with interested and knowledgeable parties, for finalizing the purchase and operation of the chosen vessel at the soonest. Fellow Dominicans, ladies and gentlemen, God has blessed us with a country that is able to produce more than we can consume at any one time. Evidence of this was on display at the "Market Day with a Difference" this year. The markets were overflowing with an abundance of produce of a wide variety, a clear indication that the farmers are responding to the initiatives of Government to boost production. To encourage the emergence of other products and new industries, Government, within the next three months, will establish a fund for Innovation and Development in Agro Industry. The fund will be targeted at agricultural communities, and at farmers groups and individuals, with the interest and motivation in adding value to agricultural raw material, by converting them to marketable, finished products. This initiative will not only eliminate waste, but it will allow for the farmer to spend more time on his farm. The hotel and resort sector is showing great promise, growth and expansion. The Rosalie and the Secret Bay Resorts have achieved the distinction of being ranked by the prestigious magazines, 'Travel and Leisure', and 'Condé Nast Traveller', among the best intimate hotels in the world. The success of Secret Bay revealed the need for expansion of the resort, which was successfully carried out recently. There are a number of properties of varied sizes, which have opened their doors to the public in recent months. We should be in a position to conclude very soon, the negotiations for the management of the Cabrits Hotel. Training for potential employees is ongoing, and administered by the Small Business and Employment Agency, in collaboration with the Dominica State College. We can also celebrate the successful start of the cruise season. Due to the efforts of Government, there will be a 20 percent increase in cruise ship calls over that of the last season. I call on all stakeholders in the tourism and cruise business, to conduct their affairs in a manner that does not undermine the current promise of growth of the sector. Fellow citizens, ladies and gentlemen, Government has made the creation of employment a priority. According to the International Labour Organization (ILO), global youth unemployment stands at 12.6% and 73 million young people will be without work in 2013. The ILO calls for action on youth unemployment. We concur with the recommendation of the ILO for the adoption of "fiscally sustainable and targeted measures, public employment programmes, employment guarantee schemes, labour-intensive infrastructure programmes, wage and training subsidies and other specific youth employment interventions." This financial year, the government is investing over $9 million into the Employment and Small Business Support Unit for small business development, employment, and job creation initiatives. I wish to announce at this time, that through the National Employment Programme, which will be officially launched on 2nd December 2013, the Government of Dominica will engage over 400 people in direct employment initiatives. As a matter of fact, already, 95 individuals who have completed hospitality apprenticeship training in Portsmouth have received confirmed placements at over 25 hospitality establishments in the North and will be engaged for a period of one year. 240 individuals who have completed training with the Employment and Small Business Agency, Adult Education Division, Basic Needs Trust Fund, and the Dominica State College will be engaged in an on-the job training and mentorship programme with over 80 businesses and organizations across the island. 35 university graduates will receive opportunities for internships with the Government and other Statutory Bodies including the AID Bank, Invest Dominica Authority and the Dominica State College, to name a few. 10 Communities will receive support to hire over 50 individuals on special community projects including community tourism initiatives, resource centre management, school feeding programmes and landscaping. Through a new Education Mentorship Programme over 50 young people will be employed to provide after-school care, tutoring, and homework assistance to primary and secondary school students in communities across the island. A number of other initiatives will be launched in 2014 to provide specialized assistance to expansion of small and medium-sized businesses with job creation potential. A package of direct marketing support, technical assistance, and financing will be made available for such businesses. These employment initiatives will provide recent graduates and unemployed youth with a valuable opportunity to gain experience and job-related skills and knowledge. We also believe that the business community will gain significant benefits from the additional human resource support that this initiative will provide. Fellow citizens, ladies and gentlemen, the business and investment environment is dynamic and competitive. This is especially so with offshore data entry and call centre enterprises. To survive and compete in this sector, the trick is to always have in place, a modern state of the art infrastructure, capable of attracting new entrants with minimum disruption. We applaud the efforts of the AID Bank for remaining on top of the game in that regard. The Government is at an advanced stage of discussion, with a United States based company, to establish a new centre that will employ up to 400 persons. These new jobs will become available to employees who were displaced by the downsizing of Clear Harbour, in the first instance. Interviews with some of them, and others, have already commenced. The discussions ran into a slight snag, with respect to false information sent to the company, concerning the rate of attrition of workers in Dominica. I am confident, however, that with our intervention, we shall get these negotiations back on track, and very shortly we should be in a position to update the country on this very significant development. To complement the small business initiative administered by the Government, we will enter into a loan agreement with the National Development Foundation of Dominica (NDFD), through which a $5.0 million low interest loan facility will be channelled for on-lending to start-up and existing small business enterprises. The first $2.0 million will be made available this very month of November. So, to persons who have a business idea, and need the start-up capital to turn vision into reality, your Government, through the NDFD, shall provide a helping hand. Ladies and Gentlemen, the health of the nation is of paramount importance. Health care remains a priority for this administration. Despite the proactive policy and heavy investments made in this area, the escalating cost of health care, influenced almost fully by external factors, remains a concern. We must address this as a nation. I wish on this occasion to remind all, that there is a level of personal responsibility that must come into play. Government has received draft designs from the People's Republic of China for a new hospital. The designs are currently being reviewed by health personnel and advisors, to ensure that the new hospital, when it is finally delivered, meets our expectations and requirements. Meanwhile, since the announcement of Government's intention to purchase some much needed equipment, we have been engaged in ensuring that these pieces of equipment become available to the people of Dominica, in the shortest possible time. I must report to you, that by 20th December 2013, the new CT Scan machine should be delivered to the Ministry of Health. The new Mammogram machine is expected to be delivered on 21st November, 2013. Laparoscope is expected to begin by 25th November, 2013. Government has allocated $1.5 million for the purchase of an MRI. Additional pieces of equipment have been recommended, and resources are being sourced for their inclusion in the purchase. All of these pieces of equipment, together with the construction of the new hospital, seek to ensure that we bring better health services to the doorsteps of our people and to reduce the cost to access health care overseas. Health is a key area of focus for this administration and in the not-too-distant future, certainly, before the end of this year, I will make a major announcement, in this regard. Fellow Dominicans, ladies and gentlemen, another achievement of this Government is the significant improvement to the road network. We can now boast that most of our major roads are in good condition; reducing the time of travel, saving on fuel, and reducing the wear and tear on vehicles. Engineering designs and survey work for the upgrading and rehabilitation of the east coast roads from Pond Casse, right through to the White River, is currently ongoing. Seventeen feeder roads will be improved with work expected to start during the second quarter of next year and, of course, we await the opening of the Pond Casse to Melville Hall section of the new highway. In the area of education, all of our citizens, young and old alike, believe that education is the passport to success. This recognition has been emboldened with the completion of the new Dominica State College, and with the realization that soon, our young people will be able to remain right here at home, and earn a university degree. The record enrolment for this semester, and graduation of 320 students from the College just a few weeks ago, is evidence that Government's education policy is working, and delivering the expected fruits. Fellow Dominicans, ladies and gentlemen, we continue to respond to the high demand for housing solutions around the country. Never in the history of Dominica, have our people been so inspired and moved to own homes at the rate that we are receiving queries and applications. This is very commendable. Our response has included the construction of houses throughout the country, and includes the commencement of the construction of 60 apartment units in Elmshall and Bath Estate. It includes the regularisation of squatters and land development, and it includes the renovation to homes of many disadvantaged persons throughout the country. Government intends to continue to work with our citizens to facilitate wherever and however possible, to ensure that every Dominican has an acceptable housing standard. Central government has just released a further $3.0 million for use in home repairs across the island and another $4.0 million will be made available in grant form, for the elimination of pit latrine initiative, which I spoke about a few weeks ago. I am dumbfounded that there would be persons in this country, who would oppose such a programme, at this time in our nation's development. Nonetheless, we shall press ahead, and I insist that pit latrines or what some call "out houses", shall be a thing of the past in Dominica, under my watch as Prime Minister of this country. Within the last two years, 63 loans totalling $10.5 million was loaned to public officers through the Government Housing Loans Board. We will continue to support the work of the Board to ensure that the housing needs of public officers are addressed. In addition to all that has gone on, and which is currently underway in the housing sub-sector, a further $5.0 million will be funneled through the Aid Bank for on-lending, at very low interest rates, to persons who fall in the low income bracket and who would not normally qualify for regular commercial loans or mortgages. Fellow Dominicans, ladies and gentlemen, these are difficult times the world over, and resources are scarce....but we shall do what we must, to guarantee our people a satisfactory standard of living and a higher quality of life. Our projections for GDP growth for Dominica in 2013 is 1.6 percent. Given the global challenges, the achievement of growth is not easy, but we have stayed the course and we have ensured that the platform for reducing poverty remains intact. However, reaping the benefits that are held in that promise, calls for each of us to commit to the mission of pursuing excellence, in our approach to work, and in the conduct of our lives. Very importantly, we must promote the positives about Dominica. We must work to build and not tear down this country! We need, as Dominicans resident at home and abroad, to get into the business of promoting Dominica, and all that it offers. We need to wrap our utterances in the flag. We need to say and do what helps to build the image of our country. There are many friends and development partners of Dominica who continue to collaborate with us in our development efforts. I say a special thank you to the Governments of the People's Republic of China, the Bolivarian Republic of Venezuela, the European Union, Morocco, Cuba, the United States of America, the United Kingdom, France and Japan. Your continued assistance to us, is demonstrative of your mutual respect and friendship, and the confidence that you have in this Government's ability to make good use of these resources. On behalf of the Government and people of Dominica, I say a heartfelt thank you. Fellow Dominicans, ladies and gentlemen, there are economic hardships the world over. There are social challenges across every continent but your Government is working. You can see the evidence of our numerous achievements all around you. You have heard the number of new initiatives for further development and advancement of our country. Now is not the time to change course. Now is not the time to listen to false prophets making unrealistic promises. Let us continue together on the path of progress that we have charted. I remain concerned about some attitudes and behaviours in our society. We must encourage hard work and productivity. We must build a spirit of national pride. Let us make a 35th birthday pledge of building our nation in an environment of peace. Let us move forward together with one mission advancing the growth and development for the benefit of all of us. Happy Independence Day Dominica! May God Bless this wondrous isle.